Download anything you need to start your new Vue.js project from a single page. 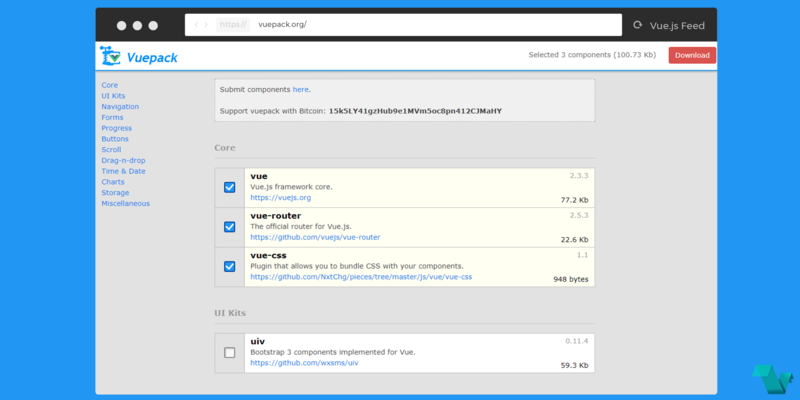 Using VuePack you can choose from a range of available Vue related projects, for example, vue-localstorage or vue-form, besides core packages like vue-router. When the desired components are selected, their total size is displayed before download, and they all come as a single minified JS file. That is all, head to http://vuepack.org/ to go through the whole list of available components for downloading and choose your own.